By the time you hear the tune of the new Fantasy Artists of Etsy exhibition, Siren Song, drifting over the breaking waves, it'll be too late. 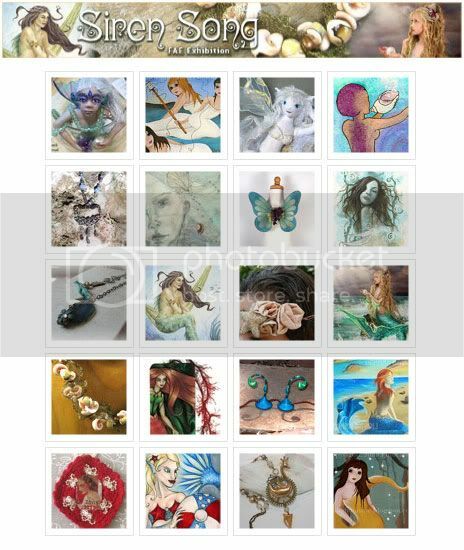 The Etsy Mini below is just a glimpse at the mermaid paintings, fantasy jewelry and other handmade sea creations that will ensnare you. EDIT: Siren Song has been replaced by another exhibition, but click on the screenshot below to view all the FAE items currently for sale that are tagged with the word "siren." Wow what an extraordinary exhibition of sea loving creations, many of which I had not found on Etsy before. I always love finding new mermaids to add to my collection. I love the fae exhibitions! Always lots to look at. This is a gorgeous collection! I wanted to thank you, too, for joining my art blog hop! Reminds me of the theme poster that my daughter made for her project last week. She come up with ocean and mermaids as her design because she's a fan of mermaids and even though she's already in 5thgrade she still believes that they do exist. Ooh, this is an awesome collection! !